A version of this essay appeared in The Oregonian, November 18, 2012. What the “Walkable City” Means for Golf. Jeff Speck, Walkable City. How Downtown Can Save America, One Step at a Time. Farrar, Straus and Giroux, Nov 13, 2012. $27.00. Where Does Golf Fit in the Walkable City? 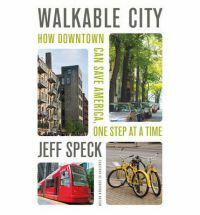 Urban planner Jeff Speck’s Walkable City is both a forceful analysis of what’s wrong with most cities and a ten step program for fixing them. Given that 80% of Americans now live in urban areas, anyone interested in improving the quality of city life should read this book and heed its lessons. Walking provides health benefits, too, and people who walk to work (or to public transit as part of their commute), and to shop and visit friends get health benefits in addition to saving money. But the benefits flow from a city or urban area already organized to encourage walking . Christopher B. Leinberger, a professor of urban planning at the University of Michigan, is the source of much of Speck’s information about these shifts in real estate values, whose effects were accelerated by the Great Recession. Leinberger, who writes regularly for the OpEd pages of the NY Times, reported some remarkable findings in May, 2012. “Our research,” he wrote, “shows that real estate values increase as neighborhoods became more walkable…. There is a five-step “ladder” of walkability, from least to most walkable. On average, each step up the walkability ladder adds $9 per square foot to annual office rents, $7 per square foot to retail rents, more than $300 per month to apartment rents and nearly $82 per square foot to home values. The enemy of the livable city, the destroyer of worlds, was the car. The enormous apparatus of freeways, highways and parking lots built over the last one hundred years, Speck demonstrates with disturbing clarity, destroyed what made city life attractive in the first place to serve the needs of the automobile. The tradeoffs were transient. Planners succumbed to the car so completely that master-planned suburbs dispensed with sidewalks altogether, and engineered streets for cars alone. (One of the saddest facts Speck adduces is that only 15% of children now walk to school. Walking to school isn’t just good exercise, it’s a powerful socializing instrument, too.) Wherever walking is dangerous, property values fall, commerce ceases, and the quality of life ebbs. To reverse that process, you have to figure out how to get people back on their feet. Speck’s ten step manifesto points the way forward, with humor and grace and just a soupcon of urban elitist zeal. Many of the suburban “communities” suffering from the real estate collapse were built around golf courses, and the golf industry has suffered hugely from the recession (although it’s arguable that the industry’s decline reflects a longer trend). Although the National Golf Foundation reported recently that rounds played are up 7.4% this year over last year nationwide, overall participation rates and rounds played have not come close to approaching the peak year of 1999 (the last year of the Clinton expansion, and the preamble to the dot.com bust and the recession of 2001). 564 million rounds were played in 1999; last year, it was 463 million. In 1999 there were roughly 14,200 “18 hole equivalent” courses in the US; in 2011, there were about 14,800 courses, which means more courses were chasing fewer rounds. If you were the CEO of a business with this profile, you’d be canned. The collapse of suburban real estate values is tightly yoked to the collapse in golf course evaluations as well. Traffic congestion, in a perverse way, has helped restore the walkable urban core. Speck summons convincing evidence that building more freeways exacerbates rather than solves the traffic problem, and pushes affordable housing further away from the city center. Bubble suburbs turned into ghost towns, and golf courses far from city centers were neglected and even abandoned. Roughly 1,100 golf courses disappeared from the industry census between 2010 and 2011. If the average cost to build those courses was $5,000,000 (a conservative estimate), then the loss was at least 5.5 billion dollars. Eric Larsen, who for years designed world-class golf courses as a lead designer and business development executive at Arnold Palmer Design, has been thinking about how to reposition golf courses over the last several years as it became dreadfully clear that the field of dreams strategy the development industry had been following was not yielding dividends. Two years ago, Larsen left Palmer Design to start his own consultancy in order to test some ideas he’s been germinating as he watched the golf economy stagnate. Was it possible, he wondered, to steer a course somehow between the Scylla of reduced demand and lowered revenues and the Charybdis of plowing under the golf course? Larsen’s first thought was simply to reduce the number of holes, from 18 to 9, but rather than simply abandoning the golf course—which may have been zoned as open or green space—he recommended converting the sixty to eighty acre parcels to mixed use parks. Most of the expensive infrastructure for the golf course—the clubhouse, the pump station, most of the irrigation system—could be preserved, but the remaining land could be soccer pitches, baseball or softball fields, beach volleyball courts, and so on. Dog parks and walking trails could also easily be incorporated, and users of the facilities charged fees, which might also give them access to workout facilities of the clubhouse, if any existed. In other words, create a hybrid mixed-use park system on the footprint of a portion of the golf course. The difficulty with this scenario from the golf operations side is that 9-hole courses are regarded as the inferior cousins to full-18 hole courses, even if the individual holes are excellent, as they presumably would be in most cases where qualified golf course design firms did the original layouts. Operators typically cannot charge the equivalent of half of an 18-hole green fee for a 9-hole round, or for an 18-hole round that involves two trips around the same 9. The perception that 9-hole courses are not “real” courses persists, even though the very existence of 9-hole course addresses one of the central issues the golf industry faces as rounds decline: that golf is a time bandit, taking five or six hours for an 18-hole round, especially in you factor in travel to and from the course. A 9-hole round makes more sense for most people in the prime of life, when work and families are higher priorities than recreation, even though golf is an excellent form of exercise if players walk. Courses that now seem quite urban at one time were in the far distant streetcar suburbs . Portland Golf Club, for example, which hosted the first post-WWII Ryder Cup and is still one of the best private courses in the Pacific Northwest, built dormitories in its clubhouse because members could ride the trolley right to the course, play a round of golf after work during the long days of summer, then spend the night at the clubhouse before heading off to work and then eventually home. That sort of arrangement was common, but the ease of driving and the spread of automobile culture eliminated the need for overnight rooms in a golf course clubhouse. New York and San Francisco are the only cities I know of where golfers routinely take public transportation to the golf course, although some of Chicago’s munis encourage golfers to take the bus. New York is the beau ideal of the walkable city in America, according to Speck. Only 45% of New Yorkers own cars, and only 30% of those car owners use them to commute to work. Portland is trying to emulate New York, but without the public transportation infrastructure. Still, it would be possible to take public transportation to at least two of Portland’s munis, Eastmoreland and Heron Lakes. Portland’s light rail Max line has a station next to the Expo Center, which is just under a mile and a half from the Heron Lakes clubhouse. A free shuttle during peak hours might encourage golfers to at least consider taking the train to the links. Binding the city’s golf courses more tightly to public transportation might reintegrate golf into Portland’s civic life, where it was once firmly entrenched. Portland is a paragon among American cities, Speck argues, because its politicians, planners and citizens understand the broader benefits of policies that encourage walking. Portlanders pay attention to trees, to bike lanes, and to public transit. It’s relatively easy to live comfortably here and not own a car. Portland’s not New York, but its ambiance is closer to Copenhagen’s or Amsterdam’s than it is to Detroit’s or, heaven forbid, Beijing’s. Mayor-elect Charlie Hales is among the enlightened walking advocates quoted by Speck. There are also numerous tips of the hat in Walkable City to The Oregonian’s Jeff Mapes, author of Pedaling Revolution, which Speck calls “the seminal book on urban cycling.” Biking works best in tandem (so-to-speak) with walking, not as a separate realm. Walmart may get blamed for destroying the commercial cores of small towns, but Speck’s analysis suggests that the enthusiasm of traffic engineers for speeding motorists through downtowns was the real killer. Thoroughfares that once welcomed shoppers with curbside parking and pleasant sidewalks under a shaded canopy were converted, in Speck’s stinging phrase, into “automotive sewers.” They welcomed cars, not shoppers. Restoring walkability is the antidote to the dull, eviscerated cores left over from failed experiments with pedestrian malls, one-way grids, and elevated freeways.